Markings: The left side of the slide is marked “COMMANDER / *MODEL*”, “COLT”, “AUTOMATIC / CALIBER .45” and with the Rampant Colt logo. The right side of the slide is marked “COLT’S COMMANDER MODEL”. The right side of the frame is marked “CLW017945”. The barrel is marked “COLT .45 AUTO”. The left front of the trigger guard is marked “3” and the rear with “VP” in a triangle. The right front of the trigger guard is marked “D”. Sights / Optics: This pistol is mounted with a flat topped square notch dovetailed into the top of the slide. The front sight is a short, serrated ramp with a rounded front edge that is fixed to a flat on the top front of the slide. Stock Configuration & Condition: The grip is a one-piece wraparound checkered black rubber Pachmayr Signature Model. The mainspring housing has also been replaced with one presenting checkered black rubber. The grip has some cracking on the bottom-front at the pinky-finger shelf on each side, otherwise showing only light handling marks. The grips rate in about Very Good overall condition as not original to the gun. Bore Condition: The bore is bright and the rifling is sharp. There is no erosion, but there are two shallow rings near the muzzle. Overall Condition: This pistol retains about 98% of its metal finish. The barrel, hammer and grip safety show light operational wear, otherwise the pistol has only a few scattered light marks. The pin heads are unmarred. The screw heads are sharp. The markings are clear. Overall, this gun rates in about Fine-plus condition and would rate Excellent but for the wear in the grips. Mechanics: The action functions correctly. The slide has little play to the frame. The trigger is crisp. There are no cracks in the frame. We did not fire this pistol. As with all used firearms, a thorough cleaning may be necessary to meet your maintenance standards. Box, Paperwork & Accessories: None. Please note, this pistol does not come with a magazine. 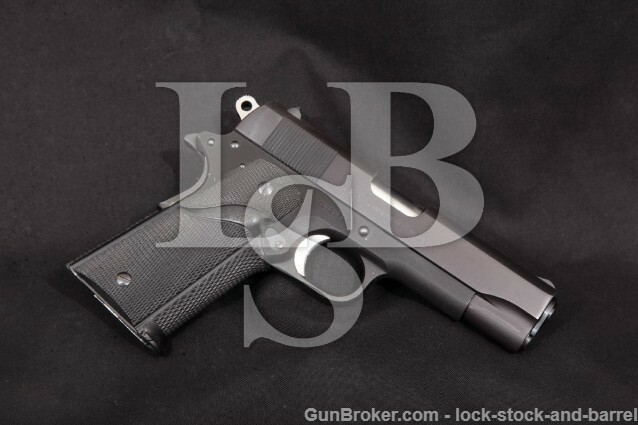 Our Assessment: This is a Colt Commander Lightweight made in 1974 chambered in .45 Auto. Colt made a Commander version of its 1911A1 pistol starting in 1950 with a lightweight alloy frame and a 4 ¼” barrel, but changed its name to Lightweight Commander in 1970 to distinguish it from the newly introduced all steel Combat Commander. The shorter barrel and alloy frame make this pistol more suited to regular carry than the full-size Government model while using the same magazine and having the same grip for familiarity. This example is in Fine-plus condition with about 98% of its metal finish, a great bore and strong mechanics. It looks like it has seen little use but could stand to see some more! This would make a superb carry pistol with its slim, single-stack frame, powerful .45 ACP chambering and Colt quality. Please see our photos and good luck! CA Legal or CA Private Party Transferable: This handgun CANNOT be transferred as a dealer sale in California but CAN be sold as a Private Party Transfer (PPT) at our Simi Valley shop. All cartridge firing handguns (even C&R’s and antiques) sold to a California resident must be DROS’d. This does not apply to out of state residents.